Inspirational new products to discover at Melbourne Gift Fair. The new ImportAnts Paper Pottery is a contemporary range of designer pots and accessories handmade from sustainable and recycled materials. It’s light weight, unbreakable, waterproof and beautifully versatile ― made from paper, lined with natural rubber so that it is completely waterproof internally with a protective water repellent layer outside. There are four ranges in a variety of on trend colours. 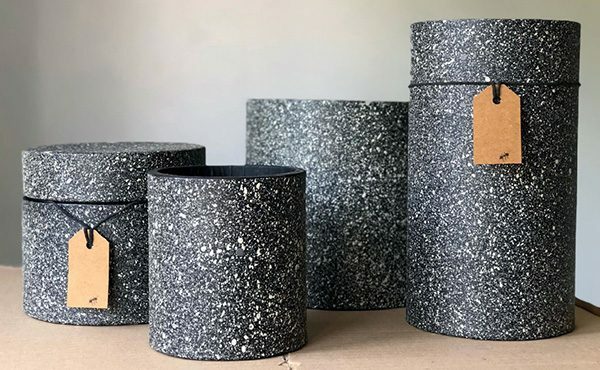 Bakara which has a metal eye let allowing the pot to hang on the wall or stand; Airlie with its distinct suede finish in three beautiful shades of grey and blues; Dalby in classic black granite and soft grey concrete, and Caloola with its natural upcycled look stitched brown paper. ImportAnts Paper Pottery will find a home in many retail settings. For florists the pots can be used with oasis for floral decoration or as a decorative planter. They offer a wonderful alternative to heavy and expensive glass or clay pottery that is breakable in store. For nurseries as an alternative to gift wrapping, the planters have been designed to fit the Australian standard pot sizes used by growers. There are three pot sizes available, small, medium and large. Homewares and kitchen stores will find so many uses for them―a hanging or standing vase for flowers, a utensil holder in the kitchen or bathroom, ideal with children as there is no need to worry about breakages. A decorative pot for plants, simply drop your plastic pot with the plant in it, no need for a saucer…there is even a toilet brush holder for use with the Eco Max toilet brush. To celebrate the up and coming gift giving season, the team at Enjoy Lighting have curated a beautiful collection of their favourite pieces in an opulent gift box that will be sure to put a smile on anyone’s face. Three new designs and three all-time festive favourites all presented in a luxurious black embossed black satin lined keepsake gift box. Bringing your home to life with the botanical inspired candles designs will bring instant visual interest and texture to your space―not to mention the fact that these flameless little achievers look fabulous when turned on, creating a transparent glow showcasing their designs even more. Let the festive season come alight with this elegant representation of the classic Christmas style. Not too busy or ostentatious, these two stunning designs will add style and happiness to your home. Available in single pillars or in a luxurious keepsake gift box, the choice is yours. Taking cues from international couture and furnishing trends, we have carefully curated a cornucopia of our proven and popular three metallic finishes and hues: Handpainted Linen textured finish in a silver and gold pallet two tone combination, perfect to work back with any décor; Hammered Metal design in Bronze, for that textural luxury; and the Micro Gravel Duo handpainted in Metallic Blanc, a white for all seasons. Whatever you choose, it’s amazing to think that each candle is handmade and hand poured in a traditional candle factory. 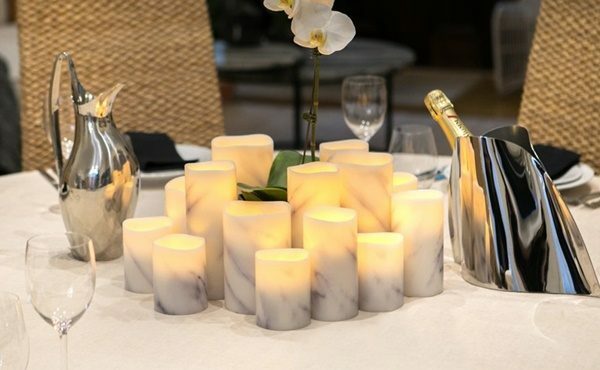 To ensure consistency from the first pour to the last, only 120 candles are made at a time. Nourish your soul with Intrinsic’s first ever release of velvety hand creams to add inspiration to your beauty routine. The new release hand creams are infused with macadamia to leave your skin feeling soft and nourished, and pure essential oils to uplift the heart and soul. In six colourful designs, the hand creams fit perfectly into your bag to give yourself a mini spa treatment throughout the day. 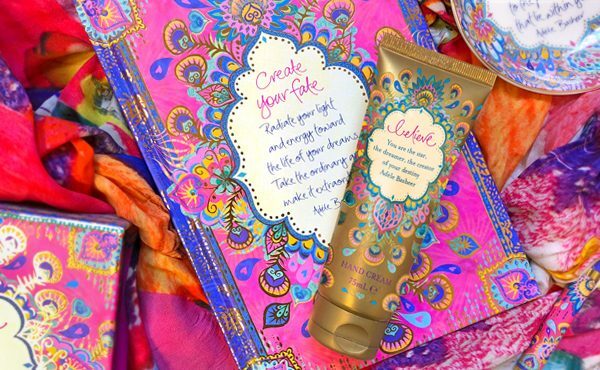 Each golden tube features beautiful boho patterning and Intrinsic’s signature look frame containing a themed quote by Adèle Basheer, founder and inspiring wordsmith behind Australian owned Intrinsic. Intrinsic fans will be delighted to further enhance their wellbeing by adding their favourite Intrinsic hand cream into their self-care routine. With a vision to infuse the world with positivity, Adelaide based Intrinsic has built a strong, loyal following of fans who deeply connect with the meaning and soulful spirit behind each piece. Check out these collections at AGHA Melbourne Gift Fair, 4-8 August, MCEC. Register to attend here.